The Kern-Kaweah Chapter of the Sierra Club will lead a hike among the wind turbines on the Pacific Crest Trail (PCT) at 9:00 am on Saturday May 20, 2017 near Tehachapi, California. 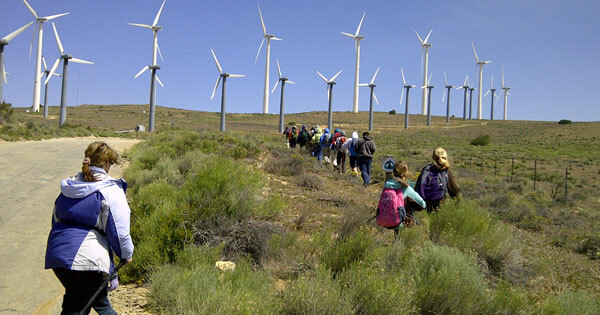 The Sierra Club's local chapter sponsors the hike to spotlight a little-known section of the trail as well as the thousands of wind turbines in the Tehachapi Pass. The event marks the 32nd year of the annual spring hike. The hike leaves the PCT trailhead kiosk northeast of the junction of Cameron Canyon Road and Tehachapi-Willow Springs Road promptly at 9:00 am. The PCT Cameron Ridge segment kiosk is on the south side of Cameron Canyon Road, 100 to 200 feet northeast of its junction with Tehachapi-Willow Springs Road. The six-mile hike is rated “moderate” by seasoned hikers, but it has steep uphill and downhill segments. Please note that this is a real hike and not “a gentle stroll through the park”. Those with heart conditions and reduced lung capacity are advised not to participate. Parents with children must assure that the children can walk the entire distance. Though there are frequent rest stops, including lunch, there are no way stations where people can be picked up by car. This is a through hike with a car shuttle at the end. The Sierra Club is a national environmental group that supports the responsible development of renewable resources, including wind energy. The hike will be led by Tony Swan, a local Sierra Club member. Swan has led the hike for most of the past three decades. Paul Gipe, an internationally recognized authority on renewable energy, will be available to answer questions about the wind turbines and about wind energy. Gipe organized the first hike in 1986. A carpool will leave from Bakersfield at 7:30 am. For more information on carpooling from Bakersfield, call Tony Swan at 661-203-3036 or Paul Gipe 661-325-9590.